The e-Gift Cards are delivered to your inbox instantly, courtesy our in-house email delivery system. We make sure your eGift Card purchase is safe and secure. We at GrabOn use SSL protocol to secure the transactions. Got a query? We got you covered! Feel free to reach out to us and we will be happy to help. A wish to gift someone an interior deco piece as a present but not sure what they would like? Well then, Home Decor gift cards are totally meant for you. Gift cards can be purchased for a certain amount and be given as a present to someone. Because gifting a present has a special meaning attached to it. It is the thought that matters. There are several home decor gift card vouchers for one to choose from. Be it to shop at the store or buy it online, there is an expanse of choices available. The fancy rectangular gift cards are like our typical debit cards, there's a certain amount of balance added to it, which can be used. One would want to own or try one of these. So, what are the home decor articles that the customers can buy using a gift card? Be it modern, contemporary or imperial and vintage, stores offer products from all these categories. Decor varieties include Clocks, Coffee Table Books, Stationery, Decorative Trays, Vases, Natural Plants, Indoor Fountains, Decorative Pebbles, Spiritual, Pots and Planters, Room Fragrances, Bird Houses and items for Garden. Clocks: Alarm Clocks, Cuckoo Clocks, Grandfather Clocks, Pendulum Clocks, Platform Clock, Table Clocks and Wall Clocks. Stationery: Calendars, Document Organisers, Laptop Sleeves, Mouse Pads, Notebooks, Pen Stands and Visiting Card Holders. Room Fragrances: Air Fresheners, Aroma Oils, Burners, Potpourri and Reed Diffusers. Prayer Items: Chowkies, Diyas & Thaalis, Haldi Kumkum Boxes, Incense Holders, Incense Sticks and Kalash & Tumblers. Furniture Accents: Magazine Racks, Trunks & Boxes, Wall Shelves, Jharokhas, Screens & Dividers, Mirrors, Temples and Ottomans & Pouffes. Other categories include: Artificial Flowers, Artificial Plants, Vases, Decorative Pebbles, Natural Plants, Coffee Table Books, Decorative Trays, Bird Houses, Garden Ornaments, Indoor Fountains And Festive Decor. Nothing matches the satisfaction one gets from saving on that extra penny while shopping. Wouldn't we want to see that smile on your face when you save? Maybe spend that saving on getting something you would want. Involve in the joy of decorating your living space with that exciting and sophisticated touch. Bring life to your room. Add a bunch of these pretty pieces of work to your beautiful home. Because when you buy something that you like, you experience that warm happy feeling. But when you present someone a gift card it is a good way to show your gratitude and everyone loves to receive one. But when gifting a gift card to someone, there is no need to spend on the gift wrapping. No need to take time out from your schedule, to go to the shop or order online. It saves time yet conveys your best wishes for the person the present is meant for. Now shopping is made easier and helps us save time. Getting an online gift card is a thing now. They have indeed revolutionized the world of gifting. Right from companies gifting these cards to their employees for festive seasons or as incentives to people buying it for their loved ones. 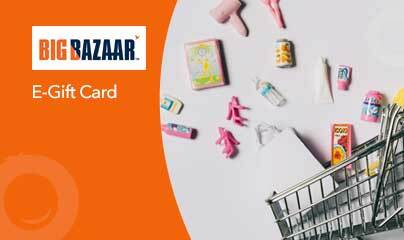 Check out the home decor gift cards for Pepperfry and Big Bazaar. The minimum card denomination amount is Rs. 100 and the maximum being Rs. 5000. Customers can choose their required amount and buy home decor gift cards online in India. When it comes to savings, there’s no place better than GrabOn for the best deals and coupons. From special discounts to amazing voucher and coupons, we have it all. Stay updated with us on this page for the latest vouchers and deals. Go ahead and buy your home decor online gift voucher today. Happy shopping!